Limited liability companies (LLCs) are a popular choice because they can fit into many different situations. LLCs are unique in the sense that it can be taxed in several different ways: as a sole proprietorship or shadow entity; as a partnership; or as a C-Corporation. 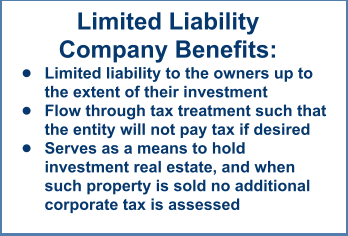 In addition, the limited liability company may be owned by individuals, Trusts, or other companies. The limited liability company and the limited family partnership can also be a great means for transferring business ownership to family. Any property held by the limited liability company or limited family partnership can be discounted for lack of marketability for reasons that the ownership in the business will be held only by family members. In addition, ownership interest in the limited liability company and the limited family partnership can be gifted to family over time thus reducing the amount of ownership interest or property held by the taxpayer, thus reducing the estate tax liability. The heirs receiving such gifts of interest, however, receive no control or vote or have the right to receive any benefit of property in the limited liability company until the taxpayer transfers management decision making and voting control to them. This serves as a tremendous tool to retain control over property yet transfer away the value to reduce estate taxes. We have extensive expertise in advising our clients on the formation and review of limited liability companies and partnerships, and can help you make sure your company is in compliance with all tax laws. Proper formation and management of an Limited Liability Company can ensure you maintain the proper tax benefits and limits on owner liability. Contact Ingersoll Firm if you need help establishing or maintaining a Limited Liability Company. We have the expertise to keep you in compliance while maximizing your benefits.